What is now known as Point of View Villa and Spa has quite a storied history. To start, it wasn’t always the vacation villa that you see today. The site of the villa was originally an artist studio for famed Polish painter and activist Michael Lester. Being of Polish descent, his original name was Michal Antoni Leszcynski. He was an artist and sailor whose talents would lead him away from his native Poland to England, where he changed his name to Michael Lester. He continued his artistic work, becoming well known for his maritime-themed paintings. While sailing the Atlantic for an English bauxite company, he encountered the enchanting Island of Jamaica. Not surprisingly, he fell in love with the beauty and the weather of the island, so much so that he decided to make Jamaica his home. After a brief stay in Kingston, Jamaica’s capital city, he and his wife Gertrude Emily Davis (Peggy) moved to Montego Bay and set up an art gallery. There he displayed and sold his paintings to well-to-do vacationers on the island. He would nestle his house and artist studio in the hills of Belmont, overlooking Montego Bay. Point of View Villa and Spa served as his studio—the place where he found inspiration to create his beautiful works. His former house is on an adjacent property just beyond the trees that line the Point of View driveway. As social justice activists, we are thrilled that Point of View used to be Michael Lester’s home. 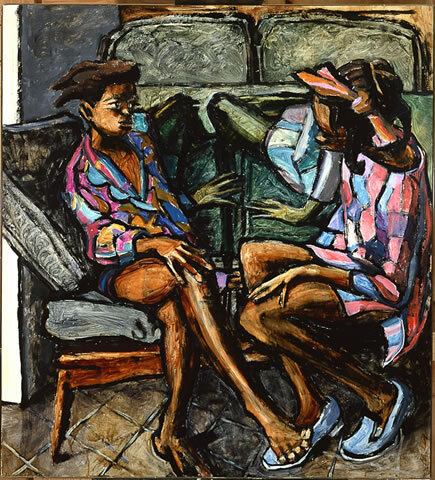 Not only did his paintings express an exceptional level of cultural nuance that is often absent from ‘tourist art,’ he also challenged segregation in his time by bringing Black models to Doctor’s Cave Beach. This further endeared him to the people of Montego Bay, and likewise to us. Tomorrow, our first artist is checking in to spend 10 days working on her book. Coincidentally, she is also an activist. We are excited to be hosting her and wish her respite and an abundance of creativity and inspiration.